It was a true struggle to come up with just the right thing to share! But after a little digging in the stash I came up with something kind of fun and bright!! I know we all buy supplies, they were on sale , they were clearance, or maybe the were just for sale!! We have the best intentions but sometimes we put it away really well!! 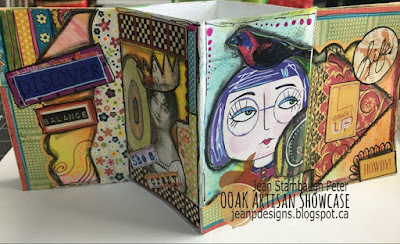 I ran across this package of 2 mini folders, and being in a zine state of mind, I felt this was perfect!! Besides I have not shared much of my collage work!! I used a technique I have done awhile ago but the paper was a bit glossy which makes this a fun project!! I stamped in stazon black ink, let dry, then using sponges and dye based ink I smushed bright color inks all over the card. After drying I added white marks to some of the black stamped images to make the whole thing pop!! Glued the flaps down and It was finished. As I said I have been crazy making zines so I thought that would be a great item for my pocket!! 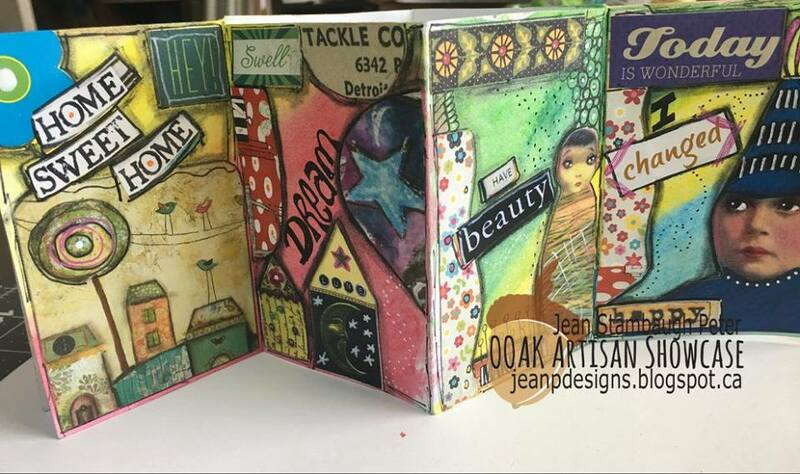 You can see more of Jean's creations online! NEWS: Registration has opened for the BIG COLLAGE Workshop with Julie Fei-Fan Balzer! CLICK here to learn more!